Here is a simple Jython Procedure to do that . print >> output_write, " The counts are .... 'n'"
sqlstmt="select count(*) as rowcount from all_tables where owner='ODI_TEMP'"
sqlstmt="select count(*) as rowcount from all_tables where owner='ODI_WORK'"
sqlstmt="select count(*) as rowcount from all_tables where owner='SYSTEM'"
and you get the output in similar form. 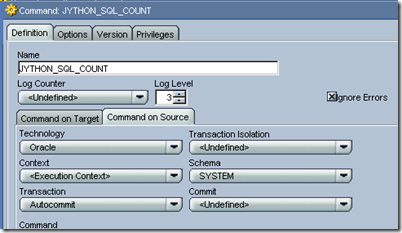 Just replace the sql count query according to your requirement. 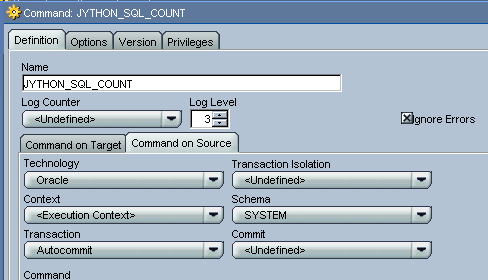 and provide the schema in the ‘Command on Source ‘ which have the select permission on the required table for which the counts are being retrieved. I too use jython in my current project which is in ODI 12c. I have observed that sometimes the jython code written inside ODI procedures gets stored in a improper format like all the code in a single link. Is it a bug in ODI or is there anyway to overcome this issue? Please help me to resolve this issue.